Where do I use my Savile Row Company voucher code? Savile Row Company provide formal and casual clothing for Men at affordable prices. They have a carefully selected range of suits, shirts, ties and shoes and even a women's section. Established over 80 years ago and based in London's famous Savile Row they are committed to providing quality products and excellent customer service. To save money on your men's formal wear and fashion with Savile Row Company head over to Netvouchercodes. 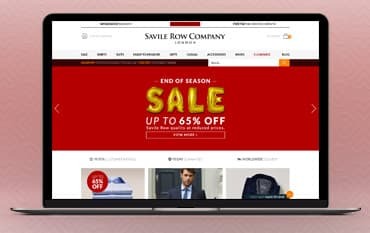 Savile Row works directly with us to provide discounts and deals on many of their products with a selection of great discount codes, e-vouchers, promotions and more. We keep all our discount codes for them in one easy space, so you can grab a code quickly and easily to ensure you save money as soon as possible. For easy and hassle-free savings simply check out our Savile Row Company deals page above and find the perfect discount that suits your booking. If you can't find a code or deal that suits you, don't worry new discount codes are added regularly so you are sure to grab some savings next time you buy. To stay in the loop and to never miss out on a bargain again, sign up to our newsletter for the first glimpse of new voucher codes and upcoming offers and receive email alerts when a discount code for Savile Row Company comes along again. Savile Row Company specialise in menswear however you will find a women's section where there's a great variety of smart and casual women's wear for discounted prices. You will find a women's clearance section, formal shirts, casual shirts, short sleeve shirts, outerwear, casual tops, trousers and sleepwear. Products start at just £15 and are all flattering, timeless and sophisticated with unspeakable good value price tags. Ship via cuff type, colour, price, design, fabric type and collar type and find your ideal piece for less. Savile Row Company have a huge range of ties available in a plethora of colours and styles. Find different coloured ties with different patterns for both formal events and more casual day to day errands. All the men’s ties available are made with pure silk and are impeccably hand-finished to set off your suit or shirt in the most complimentary way. And from just £17, you can enjoy stylish and sophisticated ties in all manner of styles for affordable prices. For even more savings on your perfect tie head to Netvouchercodes where you can grab a money-saving discount code to cut the cost of your order. Here we also have all the best deals and offers available to help you save money on your tie. The Savile Row Company is home to the world’s finest tailors, and have been crafting finely tailored shirts and menswear since 1938. As well as menswear, they also sell accessories like cuff links and ties, footwear and womenswear, with new products added regularly. As a company, Savile Row has made it their mission to provide customers with genuine luxury clothing at affordable prices and with our discount codes you can make those prices even more affordable. Savile Row also aims to extend these same high standards across all aspects of their business, with particular focus being placed on a truly exceptional and personal level of customer service.